A week of special theatre commissions including work by Rob Drummond, Gary McNair & Davey Anderson and Robert Ormerod, with the Arches Political Party the night before and the What Now? Brunch the morning after. Arches, Glasgow, until Fri 19 Sep. This traditional ‘mixed gender, low ability’ cross-border football match will hopefully be held in friendly spirits on Glasgow Green during the day, before a reading at the Poetry Club that night. Glasgow Green Football Centre and Poetry Club, Glasgow, both Sat 13 Sep.
Fresh from their run at the Edinburgh Festival, comedians Vladimir McTavish and Keir McAllister take an amused look at both sides of the debate in this comedy-come-panel show. Stand, Glasgow, Wed 17 Sep.
Playwright Alan Bissett and director Sacha Kyle’s satire (also hot off the Fringe) imagines what happens to the creatures of Scottish folklore following the referendum result, with Elaine C Smith in one of the four lead roles. Tron Theatre, Thu 18 Sep.
Celebrate/commiserate the referendum by not thinking about it at all, with Glasgow’s charity and socially focused club night. Featuring sets from Subbie icons Harri (Subculture) and JD Twitch (Optimo). Sub Club, Glasgow, Thu 18 Sep. Presented by The Stand/Assembly Rooms’ Tommy Sheppard, this concert sees an enviable array of Scottish talent (Franz Ferdinand, Mogwai, Frightened Rabbit, Ricky Ross and Lorraine McIntosh of Deacon Blue, Eddi Reader, Stanley Odd) show their support for Yes. Usher Hall, Sun 14 Sep. Returning after its Edinburgh Fringe run, Northern Irish playwright John McCann’s two-hander imagines the day after a Yes result, with Gabriel Quigley in mighty form as Scotland’s new foreign minister designate. Traverse Theatre, Tue 16–Sat 20 Sep.
Curated by Graham McLaren, this one-off, twelve-hour National Theatre of Scotland show sees the country’s most esteemed playwrights, authors, musicians and commentators read their favourite piece of writing on Scotland. Assembly Hall, Wed 17 Sep.
Dance your way into the future, whatever it’s all about, with a live set from Edinburgh’s FOUND and Moonhop’s Whisky Stephen, with poetry from the Neu! Reekie! team. Summerhall, Edinburgh, Thu 18 Sep. Described as a ‘Twitter sitcom’, David Greig’s long-running imagined comedy of two flatmates, one Yes and one No, is given a dramatic airing by the Trav on the day of the vote. Traverse Theatre, Thu 18 Sep. Exhibitions, talks, performances and more by artists from Duncan of Jordanstone College of Art & Design, with contributions from names including Calum Colvin and Dalziel + Scullion, amongst others. 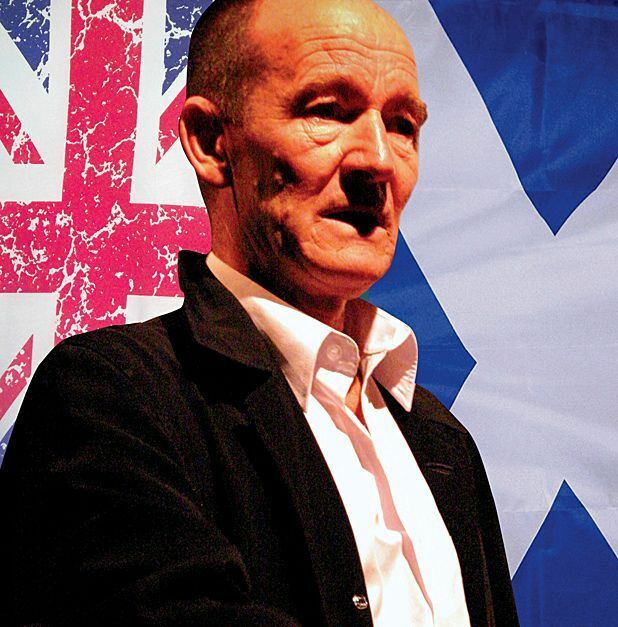 Dundee Contemporary Arts, Dundee, until Thu 18 Sep.
David Hayman’s solo theatre show presents the tale of an old left-wing trade unionist who’s forced to re-evaluate his beliefs in the face of the Scottish referendum. Concert Hall, Perth, Fri 12 Sep; Miners’ Welfare Club, Blantyre, Sat 13 Sep; Harbour Arts Centre, Irvine, Sun 14 Sep.
Theatremakers Gary McNair and Davey Anderson explore the mechanics of decision-making in this part-theatre, part-documentary piece. Platform, Glasgow, Sun 14 Sep; Gaiety, Ayr, Mon 15 Sep; Traverse, Edinburgh, Tue 16 Sep; Arches, Glasgow, Wed 17 Sep. The day after the independence referendum comedians and musicians get together to chew over the previous day's results. Smith Art Gallery & Museum, Stirling, Fri 19 Sep. The referendum will have been and gone by the time Bloody Scotland takes place, so a panel, including William McIlvanney and Tom Devine, discuss the result and what is next for the country. Albert Halls, Stirling, Sat 20 Sep.